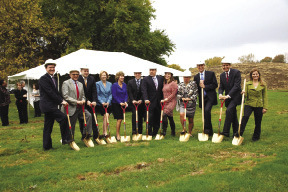 CPC breaks ground on $10.85 million Long Pond Senior Housing; Development partners: Rochester's Cornerstone / PathStone Corp.
Groundbreaking of LongPond Senior Housing. Long Pond Senior Housing is an affordable supportive senior housing development being constructed off of Long Pond Rd., adjacent to Greece Baptist Church near Ridge Rd. Rochester's Cornerstone Group, Ltd. and PathStone Corp. are development partners in this effort. Fifty-four one and two- bedroom units will be developed in the first phase of a 120-unit planned development. The units will be available to residents 55 and older who qualify under certain income guidelines. Family Service Communities will provide services to the residents in a Department of Health licensed enriched living facility. The total project cost is $10.85 million. Funding was made possible by New York State Homes and Community Renewal's Housing Trust Fund program, Monroe County, the town of Greece, The Community Preservation Corp. (CPC), RedStone Equity Partners, private equity and NYSERDA. The Rochester Housing Authority is providing 45 Section 8 Vouchers to support the incomes of many of the senior residents. Darryl Towns, commissioner/CEO of New York State Homes and Community Renewal said, "Long Pond Senior Apartments will help people live comfortably and affordably in a supportive, quality environment. Governor Andrew Cuomo's Medicaid Redesign Team is working to reduce Medicaid spending and reinvest savings in supportive housing that allows the elderly and those with special needs lead independent, productive lives. Congratulations to all of the partners and to all of the residents who will enjoy living at Long Pond Senior Housing." Long Pond Senior Housing Developer Roger Brandt noted "We are pleased to be working with PathStone and other partners, especially the Greece Baptist Church as they celebrate their 200th anniversary this month. This rental community for our seniors shall have a positive impact on the lives of many families in the Town of Greece". 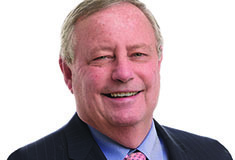 Stuart J. Mitchell, President/CEO at PathStone Development Corporation, said, "PathStone Corporation is delighted to partner with Rochester's Cornerstone Group, Ltd. and Family Service Communities, a licensed enriched housing provider, to develop the Long Pond Senior Housing. This project will provide a safe and affordable home for 54 senior citizens. Through our pioneering partnership with Family Service Communities 30 senior citizens will receive special direct personal care and case management services that will allow frail elderly to remain in their home. I commend the Greece Baptist Church for their patient commitment to this project." "Long Pond Senior Apartments will enrich the lives of 54 seniors with units fully accessible and adaptable for residents with mobility, visual, and hearing disabilities, in addition to on-site supportive services. CPC's $1.5 million permanent loan to Long Pond Senior Apartments supports our work ensuring that New York's growing senior population has a home in which to age gracefully and independently," said Richard Conley, Senior Vice President & Originations Director at CPC. "CPC is proud to join our state and local partners, including HCR, the Town of Greece, City of Rochester, Monroe County, NYS Common Retirement Fund, PathStone Development Corporation, Rochester's Cornerstone, and First Niagara Bank, in meeting the increasing need for affordable senior units." McCullough, SVP of Housing, PathStone Corp.; Gloria Harrington, CEO, Family Service Communities; Roger Brandt, Jr., president, Rochester's Cornerstone Group; John Berry, VP, Commercial Real Estate, First Niagara Bank; Carol Oster, VP, development services, Rochester's Cornerstone Group.